The UAV flight control method we propose uses LED panels and a video camera on the UAV. Specifically, the LED panel displays patterns related to the UAV commands and blinking patterns for panel detection. A panel detection process based in UAV video camera images uses the frequency of green blinking as a cue for panel detection, then command patterns are distinguished and the UAV performs tasks based on this pattern (command). In experiments we performed for panel detection and discrimination using the UAV, we confirm the effectiveness of the proposed method for autoflight control. 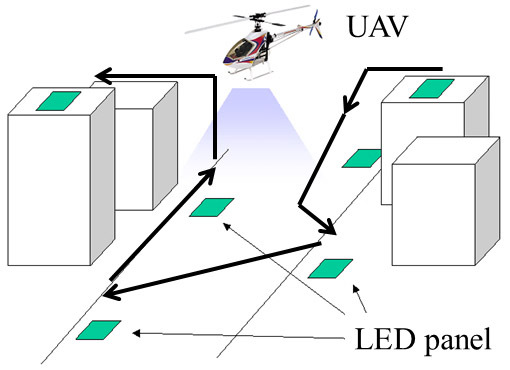 H. Ukida and M. Miwa, “LED Panel Detection and Pattern Discrimination Using UAV’s On-Board Camera for Autoflight Control,” J. Robot. Mechatron., Vol.28, No.3, pp. 295-303, 2016. M. Nakagawa, “Visible Light Communications,” ITEJ, Vol.60, No.12, pp. 1908-1913, 2006. S. Kimura, Y. Kakehi, K. Takahashi, and T. Naemura, “A Basic Study on Ubiquitous Information Environment Using Pixel-Level Visible Light Communication Projector and High-Speed Camera,” IEICE, Vol.J91-D, No.12, pp. 2781-2790, 2008. T. Yamazato, “Visible Light Communications Using LED Array and High-speed Camera for ITS Applications,” Fundamentals Review, Vol.3, No.2, pp. 45-53, 2009. H. Ukida and M. Miwa, “Development of Information Transmission System by Dynamic 2D Patterns Using LED Panel and Video Camera,” Proc. of 17th Symposium on Sensing via Image Information (SSII2011), pp. IS4-06-1-IS4-06-7, 2011. H. Ukida and M. Miwa, “Development of Information Communication System Using LED Panel and Video Camera,” IEEJ Trans. on Electronics, Information and Systems, Vol.133, No.1, pp. 8-17, 2013. Y. Tsukuda, H. Ukida, M. Miwa, and N. Chatani, “Flight Control of UAV Using LED Panel and Video Camera,” Proc. of the 6th Int. Conf. on Positioning Technology (ICPT2014), pp. 234-239, 2014. H. Kato et al., “Augmented Reality,” IPSJ, Vol.51, No.4, pp. 365-434, 2010. R. C. Gonzales and R. E. Woods, “Digital Image Processing Second Edition,” Prentice Hall, 2002. R. Jain, R. Kasturi and B. G. Schunck, “Machine Vision,” MIT Press, 1995.